In Chinese, “mein” means noodles, chow means stir-fried. 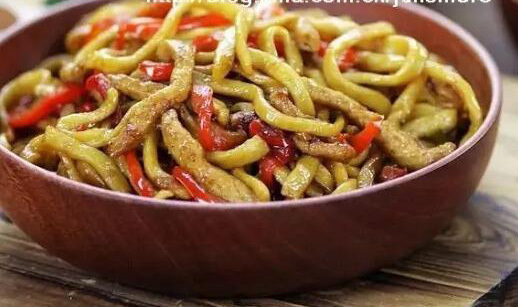 So in English, we can call this recipe pork stir-fried noodles. The best noodles to use are hand-made noodles. Not only are they fresher, but you get the satisfaction of having made something from scratch. Kneading dough, rolling dough, and cutting noodles, this processes is not complicated. Let’s start with the most basic hand-cooked noodles to complete a tasty pork chow mein. This recipe will serve two people. Want to try more chow mein recipes? Step 2: Once the water has been absorbed, you can dump it on the counter and continue to knead there (you will be able to get more leverage). Step 3: Continue to knead until all the loose flour has been absorbed, and it has taken a smooth consistency. Step 4: Roll the dough and let it rest for 30 minutes (wrap with a damp cloth or plastic wrap to prevent the surface from drying out). Step 5: Roll the dough out to about 0.2cm in thickness (sprinkle some cornmeal on the table anti-stick). Step 6: Sprinkle some cornmeal on both sides to prevent it from sticking. Fold the dough from one side, fold it back, to make a kind of ‘S’ shape (the same way as the origami fan). Step 7: Place the folded dough on the cutting board and cut it into thin strips with a knife (the thickness of the cut represents the width of the noodles. According to your preference, you can cut it into fine noodles or cut into wide noodles). Step 8: After you are finished cutting, gently shake the noodles in your hands to separate. Step 9: Voila! You have just made noodles from scratch. Step 10: Now, onto the rest of the dish. First you will slice the pork tenderloin as shown above. Step 12: Add cooking wine, corn starch, pepper powder, and white pepper powder to the pork and mix well. Step 13: Slice the pepper (red or green), and slice the garlic, onions, and ginger. Step 14: Fill a pot half way with water, cover, and bring to a boil. Step 15: After boiling, remove the lid and gently place the noodles in the boiled water. Step 17: Drain the noodles. Add a little vegetable oil to the noodles and mix well (to prevent the noodles from sticking together). Step 18: Heat the pan and pour in 1 tablespoon of peanut oil. Add the pork into the pan and stir until the color of the pork changes. Remove pork and set aside. Step 19: In the pan, pour in some peanut oil again and add the onions, garlic, and ginger. Step 20: Then add red pepper, stir fry pepper until it becomes soft. Step 21: Add the soy sauce and the pork and mix until everything is evenly coated. Step 22: Finally, add the cooked noodles and stir well to make the sauce and noodles of pork completely mixed together. Now is the time to taste it and decide whether or not you want to add salt or pepper (keep in mind, soy sauce is already salty). It is now ready to serve and enjoy! 1. This is a very versatile and simple noodle recipe, which can be used for a cold noodle dish (cool noodles after boiling), or a fried noodle dish. So feel free to experiment as much as you like! 2. Boil the noodles for 30 seconds on high heat. If the cooking time is too long, the noodles will be soft, easy to break, and the taste will not be good. Also, depending on the thickness of the noodles, the time is slightly different. (note that the cooking power and time of the noodles only applies to the fresh noodles in this recipe). 3. When making the noodles, if you don’t have cornmeal, then you can use regular flour so the dough does not stick together. Do not use corn starch, that is something completely different. 4. If you would like, you can also add a bit more dark soy sauce to make the dish a deeper color and add more flavor instead of adding salt to taste. Experiment and have fun with it!